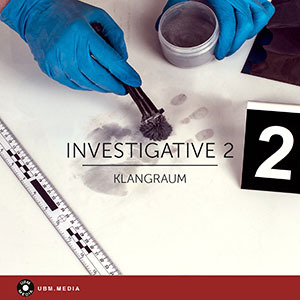 This continuation of the popular 'Investigative' album contains 25 new tracks for suspense, research, modern investigation and secret activities. Ticking percussion and ominous strings create suspense and an air of mystery. More percussive and sparse - mysterious, investigative, questioning. Nervous atmosphere, vaguely threatening. Also works for scientific research and medical investigation. Neutral electronic underscore for modern topics such as data transfer, internet security, communication, business and politics. Suspenseful electronic track. Ticking, percussive, neutral, scientific. Subtle, dark, eerie track with disquieting piano accents. Slow, cautious movement. Angular piano and electronic bits evolve into action-packed track with drums and nervous strings. Reflective, deep on thought. Pulsating electronics and lone piano accents. For research and documentaries on society and history. Haunting reduced version; chilly and mysterious with lots of room in between sounds. Mysterious electronic track; artificial and scientific; ideal for images of research, communication, data and secret investigation. No basspulse. Mysterious electronic track; artificial and scientific; ideal for images of research, communication, data and secret investigation. Warm natural bass combined with glistening electronics. Ambient and unobtrusive. Subtle electronic sounds for images of research, forensics, data analysis and science. Uneasy mood…something is brewing. Strings, percussions and ambient soundscapes create an atmosphere of mystery and vague threat. Unnerving and suspenseful. Busy electronics and slightly bizarre sound effects. Jazzy brushed drums, classy bass and e-piano. Tasteful suspense music with a vintage touch. Airy track with jazz brushes, chilled synthesizer soundscapes and an overall feeling auf caution and introspection. Glassy, bubbly synthesizer sounds. Reflective, flowing; neutral. Nerve-wrecking, unsteady and suspenseful. For images of stress, time pressure and hectic investigation. Subtle pulse; mysterious, unsteady and hesitant. Neutral and abstract electronic pulse. Guitar and electronics; soundtrack for undercover spy activities. Slow beat, melody bits, piano and warm bass form this unusual track. Busy, fast track. Minimal, nervous and restless. Cautious mood; piano, ride cymbal, percussive electronics and warm bass.